The Lutce was comfortable and the owners were very responsive. Very comfortable and homey. Several grocery stores nearby. Easy access to sites on the Left Bank. Large bedrooms allowed us to feel at home. Very easy booking. No problems. Very satisfied. Without a doubt, the view was absolutely amazing! We loved the location. There wasnt any noise from the building. Elevator was a definite plus. Easy, very pleasant and accommodating. Thank you! The views over rooftops to the Eiffel Tour and Notre Dame were wonderful. The simple comforts of Le Saint Jacques and the unique floorplan contributed to our unique adventures in Paris. The views!! They are amazing! Beautiful and roomy! Perfect for my family of teens! Great location and very safe. Clean and easy self check in. The team was very helpful, quickly answering our questions during the booking process, in the lead-up to our stay and during our stay. We had a wonderful stay. Thank you for helping us have a great visit to Paris. Great space. Everything was comfortable and well laid out. It worked well for our family of two adults and two children, ages 10 and 7. Aaron was wonderful, responsive when we contacted him. Everything was wonderful, couldnt ask for more for a visit to Paris. The features are many. Well stocked for bath, kitchen....even a shopping cart! With this view instead of walking outside we could just sit with our wine and enjoy the view. MFVR responses were helpful and timely. We thoroughly enjoyed the spaciousness of the apartment and, of course, the view. We feel very fortunate to have found such a quiet place in the middle of the busy Saint Jacques district. We had no difficulty finding good restaurants close by. Every person in the team was professional and communicated clearly. A wonderful stay with a gorgeous view. So spacious and clean. Walking distance to all major sights. Everyone we dealt with relative to the rental was excellent. All responses were prompt and very informative. Aaron, who met us at the property, was also informative and very helpful. This was the first time we spent most of our time in the Left Bank. The location of the rental was excellent. The rental had everything one would need or want for an extended stay in Paris. 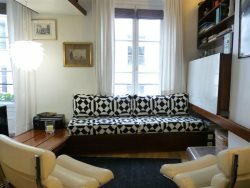 Our fourth experience with My France Vacation Rentals. We have found friendly, prompt, informative replies to our inquires, detailed instructions around how to access the property as well as may extras in the apartments themselves make this agency great. From initial booking, to confirmation of details all our inquires were answered promptly, and clarified any questions we had. Wonderful to have onsite contacts - two of them- should any issue arise while in the property. Compact, clean, well supplied apartment in a great location. Easy access - one flight of wide stairs. A little piece of Paris life. Everything was as advertised. Communication with Krystna was great. Location. Spacious. Great views thru French doors. Everything you needed for 12 days. Very fast responses from property managers and owner. Favourite feature of property was location and management. Apartment is nice and well located. Our favorite feature of the property was the view of Notre Dame and the location. All of the instructions on how to use everything were provided. Instructions on what transportation including bus metro lines were given. Very well laid out instruction book. The location was fantastic. Place was very clean. Felt totally safe. Description was spot on, and place was absolutely wonderful. Absolutely perfect for a family. While the stairs might be daunting if you have tiny kids or elderly, I would recommend it to all others. The charm of the building is a huge selling point, and the accommodation is everything you need, clean sheets and a comfy room. Description was spot on, and place was absolutely wonderful. Location was great, easily walkable to the Latin Quarter and the Louvre.